Chicagoland consists of the Chicago metropolitan area in northeastern Illinois, including Chicago and its surrounding suburbs. Broader definitions also include parts of Southeast Wisconsin and Northwestern Indiana. Cook County, where Chicago is located, is the largest county by population in Illinois and the second-largest in the United States (after California's L.A. County). With more than 5 million residents, its population is larger than that of most U.S. states; a little more than half of them live in the central city, with the rest in a chain of suburbs that surrounds Chicago on the north, west and south sides. Lake County, in the northeast corner of the state, was once largely rural but has become increasingly suburban in recent years. Its largest city, Waukegan, is also the county seat. Will County lies south of Cook and DuPage; its largest city and county seat is Joliet, undoubtedly best known for its huge prison. Just how much territory is covered in the term "Chicagoland" is a point of controversy. Certain surrounding counties in Wisconsin and especially Indiana have enormous commuter populations, which share Chicago's regional culture, and it is hard to exclude them. Lake County, Indiana, a highly industrialized and densely populated section of Lake Michigan's shoreline, represents some of the poorest suburban areas and satellite cities in Chicagoland. Gary in particular has fallen on extraordinarily hard times, and has one of the highest violent crime rates in the country. Once upon a time the city was an industrial giant, and was an urban center in its own right, but today an ever increasing number of Gary residents commute towards Chicago for employment. The three major cities on the lake are known as a gambling mecca of sorts. Hammond's Horseshoe Casino is seen as the poshest. And in terms of culture, Lake Co. is solid Chicagoland territory, from hot dogs to the blues. Plenty of great Polish and Mexican cuisine eateries exist in central and north Hammond, especially. Don't forget Whiting's famous Pierogi Fest, featured before on Oprah! Access Lake County via the free 80/94 expressway coming from Chicago or I-65 coming from the south. You may also access the casinos and beaches very quickly via I-90, aka the Indiana Toll Road, and avoid most of the urban blight that way. U.S. routes 41/20/12 all run from Chicago's Lake Shore Drive on the south side into the communities bordering on the lake. U.S. Route 12, aka the Dunes Highway, will take you directly to the Indiana Dunes. Crown Point — The county seat and home to a great bar and historical scene in the town square. East Chicago — Only a couple of miles from Chicago's eastern border, East Chicago is home to Marktown, one of the nation's most bizarre planned communities, surrounded on all sides by heavy industry. Be careful, though, as E.C. has recently replaced Gary as south Chicagoland's most crime-ridden suburb. Keep in mind that most of this crime is purely between gang members only. Gary —See above paragraph for the rundown on the former U.S. murder capital. In its defense, the city is mostly just empty now. Don't forget it does include part of the Indiana Dunes at West Beach, two casinos, a minor league baseball stadium, and Michael Jackson's boyhood home. Urban explores (urbex) find its abandoned architecture as some of the most intriguing in the nation. Griffith — A rather small town, but you’ll have several unique experiences. The high school, one of the best in the state, is the heart and soul of the town. Also to see is the local park, known as Central Park. Hammond — The largest close-in suburb of Chicago in Indiana. Offers some great deals on hotels just across the border from the city itself. Check out the Horseshoe Casino, restaurants El Taco Real & Cavalier Inn, primordial marshland in Oxbow Park, and the Lake County visitors center, featuring a John Dillinger exhibit. Munster — Lake County's most affluent suburb. Home of The Center for Visual and Performing Arts. Schererville — Your average strip mall and subdivision filled suburb. Home to the county's two main movie theaters. Growing rapidly. Whiting — Home to a quaint, well-kept downtown district & the nation's largest inland refinery. Wilhala Beach offers amazing views of the Chicago skyline. Pierogi Fest, a celebration of Polish food & culture, is held every July on 119th St. Some residents of Kenosha consider the Chicagoland denotation controversial, as it is closer to Milwaukee. But nonetheless, there is a much bigger commuter population to Chicago. Metra, the suburban train system, has a route from downtown Chicago to Kenosha. The federal government considers Kenosha part of the CSA of the Chicago metropolitan area. Chicagoland is huge; it is one of the world's largest metropolitan areas both in terms of population and area. O'Hare International Airport, one of the largest and busiest in the world, is located in the northwest Chicagoland area. Midway Airport is a smaller airport on the Southwest Side of Chicago. Dupage County Airport a "designated reliever airport" for O'Hare and an increasingly popular destination. http://www.dupageairport.com/. Chicagoland is served by numerous Amtrak routes. 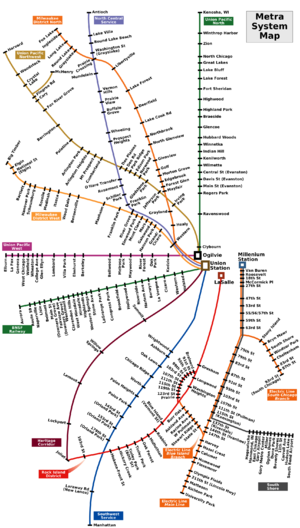 In addition to an extensive highway system, Chicagoland is served by Metra's 12 rail lines and by Chicago's CTA, which reaches some of the nearer suburbs. The Baha'i Temple, a cultural and architectural wonder in Wilmette. The beautiful Chicago Botanic Garden in Glencoe. Frank Lloyd Wright House and several houses designed by the architect in Oak Park. The Kohl's Children's Museum in Glenview. The McDonald's #1 Store Museum in Des Plaines. The splendid Morton Arboretum in Lisle. The Elmhurst Art Museum in Elmhurst. The DuPage Children's Museum in Naperville. The Tivoli Theater in Downers Grove. Chain o' Lakes State Park in Spring Grove. Volo Bog State Natural Area in Ingleside. The Joliet Correctional Facility, Illinois' most notorious prison, in Joliet. The Brookfield Zoo in Brookfield. The Forest Preserve District of Cook County  is responsible for the numerous open spaces ("forest preserves") around the county. These preserves range from heavily used parks with extensive roads and well-developed picnic areas, to relatively isolated expanses of land that are only really accessible on foot (or cross-country skis in winter). The Pickwick in Park Ridge is one of the true grand movie palaces remaining in the Chicagoland area. Ribfest in Naperville is one of the largest festivals in the county. The annual Eyes to the Skies Balloon Festival in Lisle. The Illinois Prairie Path runs through the center of DuPage County. Illinois Beach State Park in Zion. The Ravinia Music Festival in Highland Park. The Six Flags Great America amusement park in Gurnee. The Hollywood and Harrah's casinos in Joliet. For all intents and purposes, Chicagoland is Chicago when it comes to food. You don't need to head into the city proper to get your Chicago-style pizza, hot dogs, beef, steaks, and what have you. There are some Chicago-style fast-food locations outside the city that will serve you these items, prepared better than anywhere in the city. Same goes for many styles of ethnic food—you can get Mexican, Polish, Italian, Greek just as good or even better in the 'burbs. Some ethnic cuisines out here you would have trouble finding in the city—Uzbek, Russian, Afghan, etc. For upscale cuisine, the hautest of the haute is still to be found downtown. But there are plenty of nice restaurants in places like Evanston (especially), Naperville, and others. The Chicago Tribune  ("The Trib") is the Chicago area's biggest daily, and publishes a suburban edition. The Chicago Sun-Times  The other major Chicago paper, long-time rivals with the Tribune. The Daily Herald  is a large daily newspaper aimed primarily at the suburbs. Chicagoland is adjacent to Northern and Central Illinois, to Southeast Wisconsin, and to Northwestern Indiana. Parts of Wisconsin and Indiana are sometimes included in the definition of Chicagoland. This page was last edited on 24 September 2018, at 13:37.